Whether you are buying or selling a home in Annapolis, MD, there are different closing or settlement fees that you have to deal with. 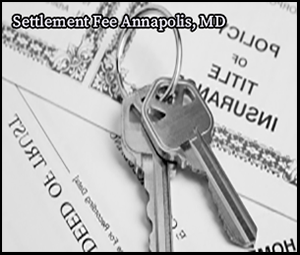 One example of a settlement fee in Annapolis, MD is the payment for ownership transfer. Local and state taxes associated with the sale of a property are also considered a settlement fee in Annapolis, MD. Who Pays the Settlement Fee in Annapolis, MD? First-time homebuyers unfamiliar with the process are often intimidated by the amount of the settlement fee in Annapolis, MD. This is because the settlement fee in Annapolis, MD includes charges and taxes that are paid on top of the down payment. This settlement fee in Annapolis, MD can easily amount to thousands of dollars. However, who should be paying the settlement fee for Annapolis, MD property purchases? Does the responsibility fall on the buyer alone? Or can the costs be divided between the buyer and seller? Typically, both parties pay a certain amount to cover the settlement fee for Annapolis, MD home purchases. For homebuyers, a mortgage loan is already considered a type of settlement fee. Annapolis, MD home sellers, on the other hand, are the ones who pay for the agent’s commissions and other costs relating to the transfer of property ownership. A large part of the settlement fee in Annapolis, MD that sellers spend for is the real estate agent’s commission. While commissions are negotiable and may vary depending on the market, the standard commission is 6% of the sales price, which is split between the listing agent and the buyer’s agent. Transfer taxes are part of the settlement fee in Annapolis, MD. These are required by the local government before making the official transfer of the title. Title Insurance: Why Pay for this Settlement Fee in Annapolis, MD? The title insurance policy is a type of settlement fee in Annapolis, MD that lenders require from buyers. It protects them from losses if the home has a pre-existing claim or lien on it, which can happen if the property was used as a collateral for a loan. To avoid any future issues for the lender, the buyer has to pay for the title insurance as a settlement fee in Annapolis, MD. Unlike other types of insurance, which are usually paid monthly, title insurance is paid up-front apart from other settlement fee. Annapolis, MD title companies, such as Eastern Title, can provide you with more information on the settlement fee for Annapolis, MD home purchases. If you are employing an attorney or settlement company to assist you with your closing, paying for their involvement is another settlement fee in Annapolis, MD. In some areas, both the buyers and sellers have their own attorneys, while in other locations, it is common to only have one. Depending on the arrangement, it can either be the buyer or the seller who pays the attorney fees in addition to any other settlement fee in Annapolis, MD. A settlement fee for Annapolis, MD homebuyers can be very expensive and may seem like a heavy burden. If you are a first-time homebuyer, you can do something about your settlement fee in Annapolis, MD. Think about asking the seller to pay some or the entire settlement fee in Annapolis, MD. Depending on the negotiation, the fees can be included in the purchase offer either as a percentage or a set dollar amount. Whether you are selling or buying a home, you need to think about covering the settlement fee. Annapolis, MD home sellers and buyers can turn to Eastern Title. Get in touch with us today for more details about the settlement fee in Annapolis, MD home purchases.